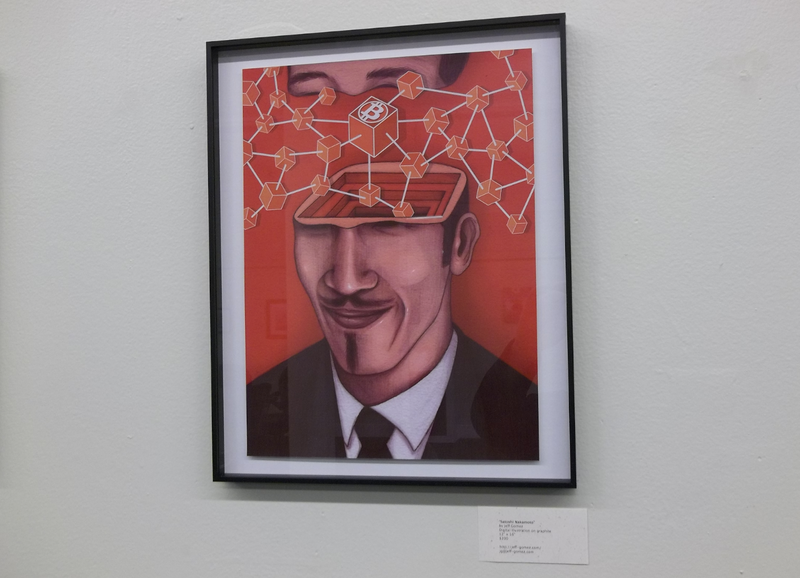 Fourteen artists showed off bitcoin-inspired works amid music and free refreshments last Thursday 6th March at the Bitcoin Art Fair in San Francisco’s Mission District. The organisers estimated that between 100 to 150 people attended the show at 20Mission – a “startup living community where programmers, designers, artists and entrepreneurs live, work and play”. The event was actually part exhibition/part bitcoin meetup. 20Mission hosts a regular get-together for San Francisco’s bitcoiners and, as well as discussing and enjoying the art on display, merchandise was on sale too – with bitcoin swag such as t-shirts, soap and even physical coins on sale. While a DJ mixed old-school hip-hop and electro tunes, bitcoin veterans and complete cryptocurrency newbies alike mingled and enjoyed the art on display. 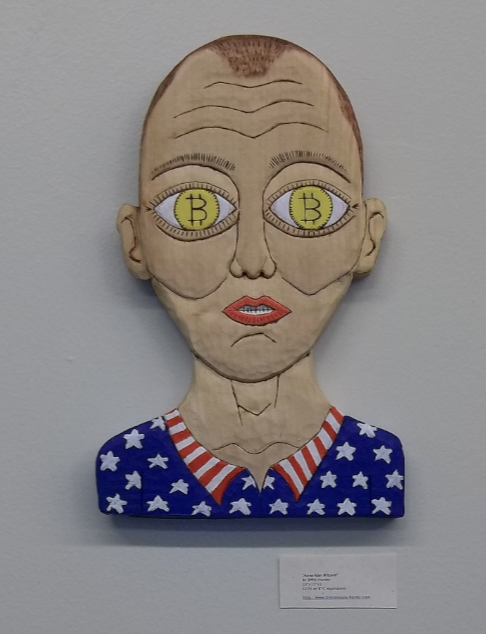 The digital currency-themed art pieces were for sale, as well as on view – with set prices on tags placed beside each work. Bitcoin was accepted as payment for those with crypto-coins in their digital wallets, while fiat was also a negotiable instrument. 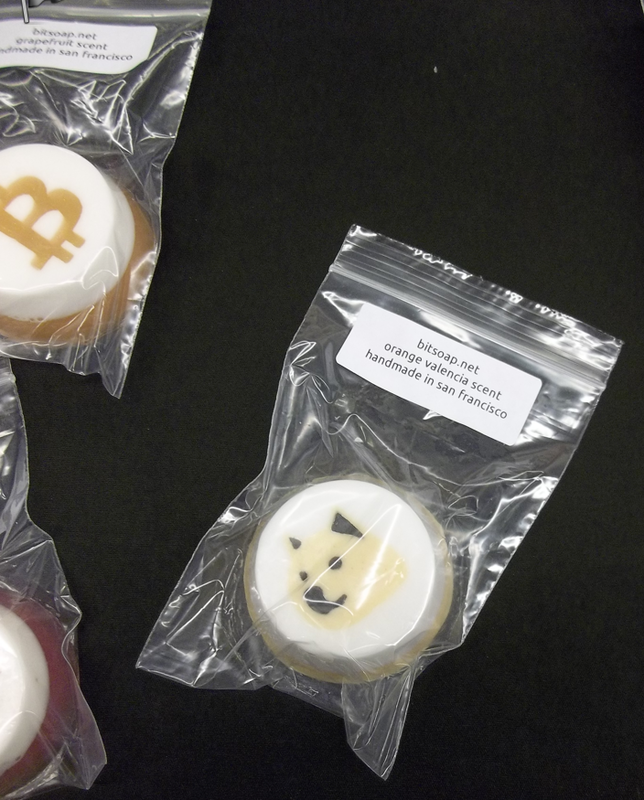 The event had more of a party atmosphere than that of a regular art exhibition, and unlike most bitcoin meetups, creativity was the focus rather than the digital currency’s technical aspects – with a little bit of merchandizing thrown in too. It’s not often that technology gets considered as art. Exceptional autos sometimes make the grade, and perhaps the more iconic Apple products could count, but art and tech often sit on different sides of the creative spectrum. An argument could be made, however, that the elegant maths behind bitcoin could be considered a work of creative genius. However, for every Steve Jobs or Satoshi Nakamoto (whoever he is), there is a Bill Gates or Larry Ellison. The former brought much creativity to their roles in the digital world, while the latter seemed mainly concerned with the financial benefits technology can bring. 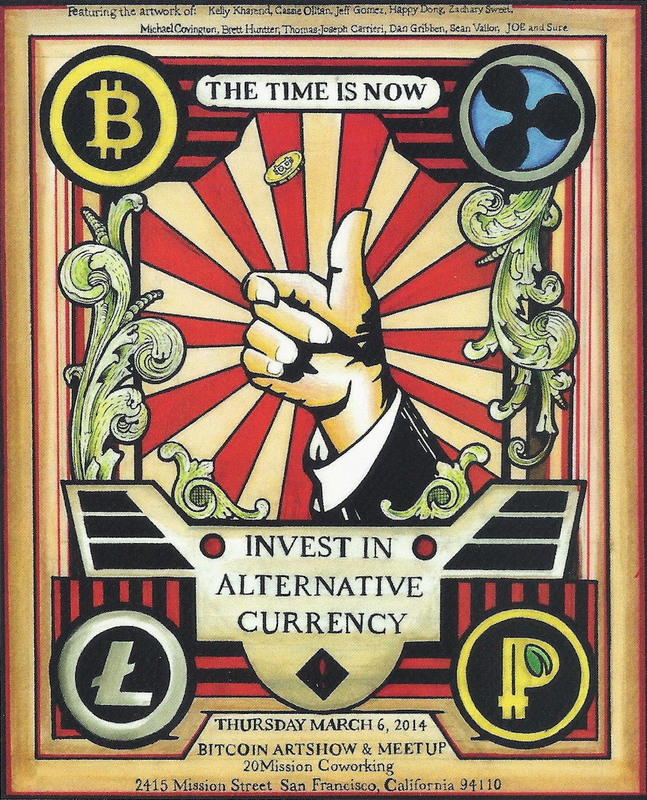 The Bitcoin Art Fair brought a refreshingly creative look at normally very technical cryptocurrency concepts. The organizers of the fair see the bitcoin economy growing, and the themed event gives credence to that. 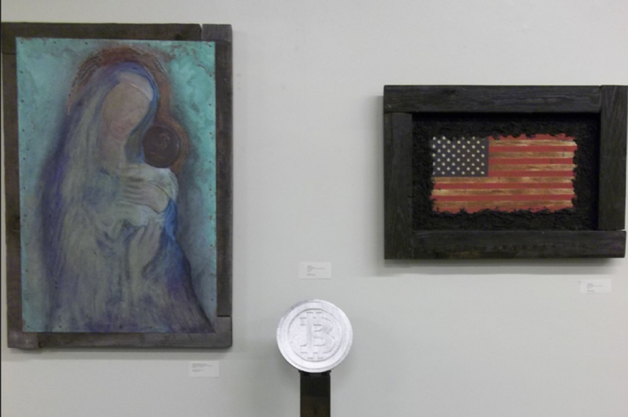 Artist Thomas-Joseph Carrieri had a number of pieces on display at the Bitcoin Art Fair. One of which was based on Mt. 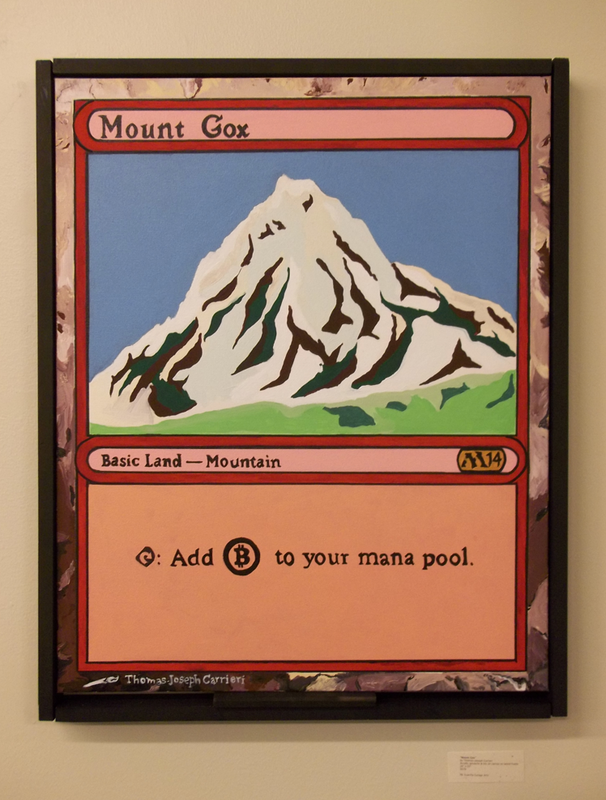 Gox, an exchange that Carrieri has been familiar with since its Magic: The Gathering card trading days – the era that inspired one of his his works. “At first there was some weird looks as if I were trying to make a crack at the situation, but the piece was really talked about at the show and it seemed very positive,” said Carrieri. 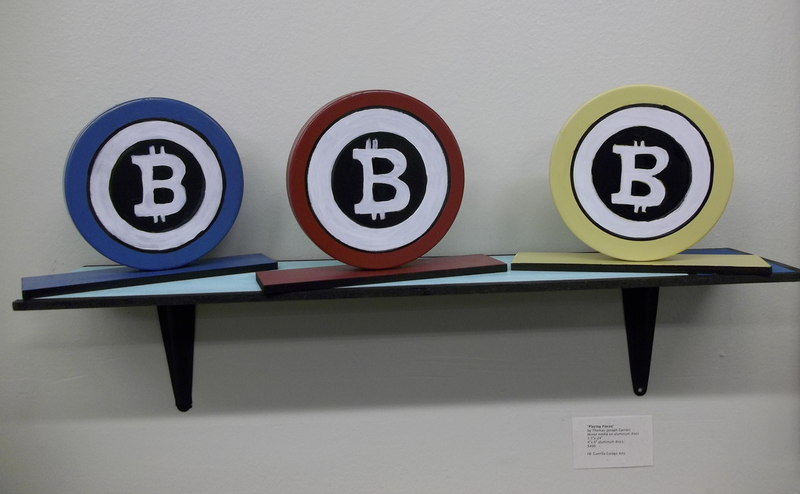 Carrieri’s “Playing Pieces” – a display of aluminum-constructed physical bitcoins – did sell at the show. The artist’s works clearly had a theme that viewed bitcoin within the prism of gaming. His “Holy Trinity” piece, a take on bitcoin and Monopoly, was another work on display at the fair. 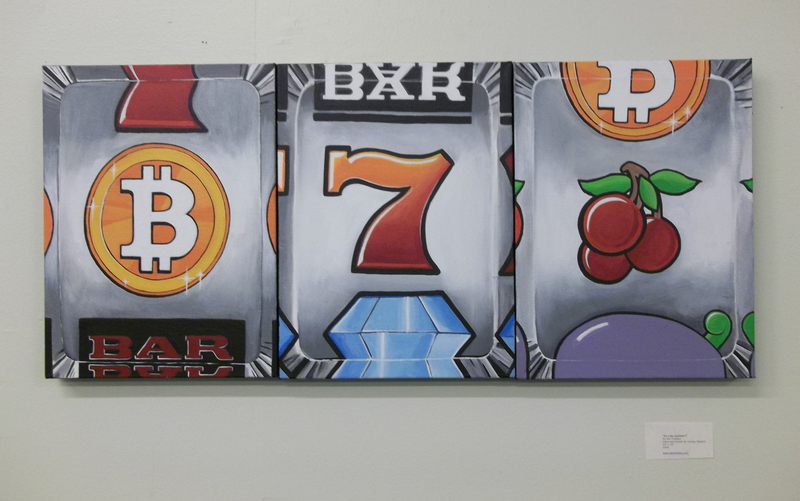 “The bitcoin ‘playing pieces’ were inspired by the whole project and the gaming point-of-view that I was going for. I thought it tied the pieces together and shed light on another aspect of ‘place holding’, ‘tokens’, ‘ownership’, etc,” Carrieri said. 20Mission is the brainchild of Jered Kenna. He was one of the founders of the suspended bitcoin exchange Tradehill, and an early investor in bitcoin. Kenna is also a regular speaker at bitcoin events, talking about his experiences in the industry. The predictability of past bitcoin events was a likely influence in creating the art fair. 20Mission is located in San Francisco’s Mission District, which lies near the intersection of 20th and Mission streets. It offers co-working spaces and also living quarters. Although use of either is not mutually exclusive, according to Kenna. In the time since Tradehill’s operations were suspended due to banking issues, Kenna has been busy. He has started the Money & Tech videocast site, “to cover what the media doesn’t” about bitcoin. That combination of practicality and inspiration has made 20Mission a hotspot for San Francisco-based cryptocurrency activities. Munoz also says that art shows are going to become a monthly occurrence at 20Mission. “This was our fourth art show and we’ve decided to make it a monthly event,” she said.